At the Ismail Center, you will enjoy the friendly family atmosphere. We are a place where no one is a stranger and working out is more than exercise. It is an enjoyable social experience with other mature adults in a very relaxed non-competitive environment. Equally important, our membership possesses a varied fitness level, so regardless if you're wanting to get back into shape or if you're training for a marathon, you will fit right in at the Ismail Center. 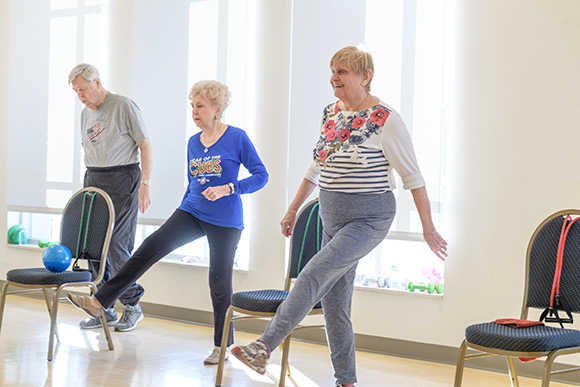 So discover one of Purdue’s best kept secrets, the relaxed, non-competitive environment of the Ismail Center and the Purdue Adult Exercise Program. To join the Ismail Center or renew your membership -- click here. We understand that everyone exercises for different reasons and has different goals. That’s why when you first become a member of the Ismail Center, we will perform your individual health and fitness assessment. The cornerstone of your personal fitness program, this preactivity screening will help us to identify your fitness level and any medical conditions or risk factors. Once your initial and totally confidential health and fitness assessment is complete, we will sit down with you and custom design a personalized exercise program. More importantly, we listen to you, to make sure you achieve your fitness goals. We understand that the path to your achievement lies within you. And we at the Ismail Center want to help you every step of the way towards realizing your health and fitness goals. Copyright © 2015, Purdue University, all rights reserved. An equal access/equal opportunity university. This page last modified on 08/18/11.